A couple of months after announcing the Galaxy Tab A 7.0 (2016), Samsung this week officially unveiled a larger variant of the tablet: the Galaxy Tab A 10.1 (2016). Sporting a 10.1-inch display (with 1200 x 1920 pixels), the Galaxy Tab A 10.1 (2016) runs Android 6.0 Marshmallow out of the box, and is powered by an octa-core processor (most likely, this is an Exynos 7870). Although the tablet's official specs sheet shows that the processor is a 11.6 GHz one (see the slideshow below), that's obviously just a typo: in reality, the CPU is clocked at 1.6 GHz. The new Galaxy Tab weighs 525 grams, measures 155.3 x 254.2 x 8.2 mm, and has a 7300 mAh battery inside. Other features include an 8 MP rear camera, 2 MP front-facing camera, 2 GB of RAM, and 16 GB of expandable internal memory. The Samsung Galaxy Tab A 10.1 (2016) was announced in Germany, where it will be available to buy starting early June, in two color variants: black, and white. Customers will have to pay €289 for the Wi-Fi-only version of the slate, and €349 for the LTE model. We don't know when the new tablet will be released in the US, but we're going to let you know when we hear more about this. Appears to be a decent mid range tab...WiFi only version seems to be good option for usage mainly at home to parents. Will be more than enough for their basic needs like browsing, video watching and casual gaming. It does look like a very good mid-range option. The specs are pretty good. If they can price it at $199, it will sell very well. But, Samsung always overprices their stuff from the start. The Tab A 7.0 can now be had for $129 or lower brand new. Great specs. The S6/S7 design looks good on this one. forget that, when will they update the tab s to marshmallow? 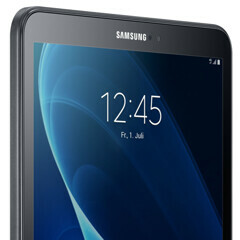 Finally a decent 10.1 inch tablet from Samsung that ditches 1280 x 800. About damn time Samsung. Not bad for the price, 16GB is a bit stingy though.